Hand crafted, this artisan bath, exclusively from The Remarkable Toilet Company (TRTC) is available in a number of metallic finishes including bronze, copper and gold. Priced at only £550 this stunning painted Blue & White floral toilet pan, available exclusively from The Remarkable Toilet Company (TRTC), is the only truly faithful reproduction of a Victorian decorative porcelain toilet available anywhere. Priced at only £550 this stunning painted floral toilet pan, available exclusively from The Remarkable Toilet Company (TRTC), is the only truly faithful reproduction of a Victorian decorative porcelain toilet available anywhere. Handcrafted, glazed and fired in the UK the square countertop basin is available in a variety of glazes and a beautiful Peacock effect. Priced at only £420, this stunning blue and white floral basin available exclusively from The Remarkable Toilet Company (TRTC), is the perfect companion for our Victorian Floral Toilet. 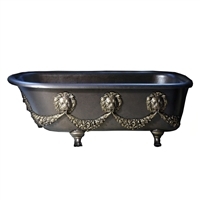 Priced at only £420, this stunning floral basin and available exclusively from The Remarkable Toilet Company (TRTC), is the perfect companion for our Victorian Floral Toilet. It is available with a number of tap hole options and with a matching pedestal or Chrome, Brass, Copper, or Black stand. Handcrafted, glazed and fired in the UK the round countertop basin is available in a variety of glazes and a beautiful Peacock effect.